Update! February available due to rare guest cancellation! Right on Waikiki Beach next to Hilton Hawaiian Village! Large California King Bed and a Queen Sofabed in living area. Free WIFI, fully equipped kitchen, large furnished balcony and... no Resort Fees. Where is the Beach? Walk through the Lobby shops, past the Pool, down the ramp, and down to the sand. Fully stocked with Beach Items and Beach Towels for our guests' enjoyment. Enjoy being down at the Beach every day or out sightseeing around Oahu. THE BEST VIEW- Not all Ilikai Views are alike. Our condo faces the coveted Marina/Ocean View side of the Ilikai. We are Stack "29" with gorgeous sunsets over the water. The other three sides of the Ilikai look at: (a) city/traffic, (b) full sun- hottest direct sun in afternoons, or (c) look into the Hilton tower (lagoon side). 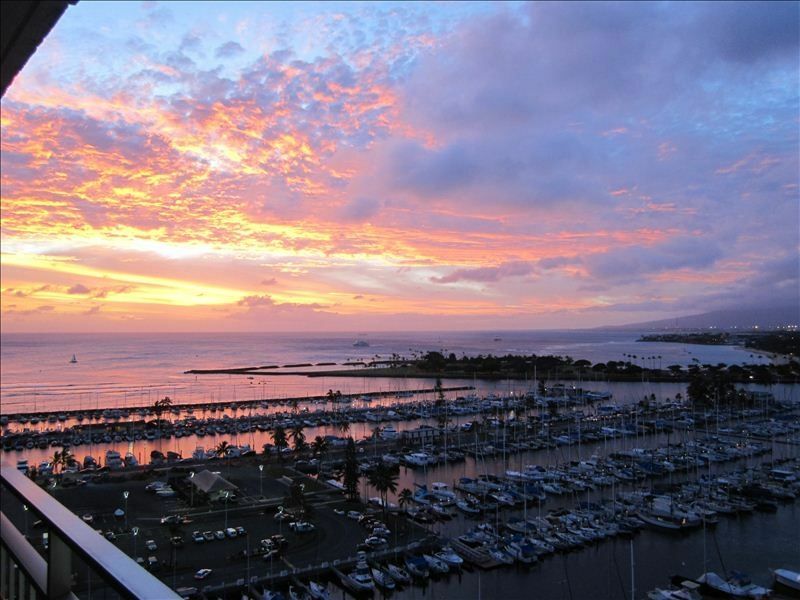 Our view has the coveted ocean and marina views and the amazing sunsets. Dine in (and out on your fully furnished oceanview balcony, and enjoy tons of local restaurants, all within immediate walking distance. Our Guests receive our WAIKIKI WELCOME E-PACKET before you arrive in paradise. We include our Top Waikiki Tips and Favorites, Parking Directions and Area Information, your WiFi Code, Condo and Hotel Info, Dining Recommendations and more! The Ilikai is on the Beach next to Hilton Hawaiian Village. Enjoy watercraft rentals, weekly Hawaiian hula and entertainment, Friday fireworks next door, and tons of shopping and dining options. Walk to Ala Moana Center, the world's largest outdoor shopping venue, or hop on The Bus and visit Pearl Harbor or Oahu's many museums. Aroma Caffe Coffee Company: just off the open air lobby serving popular coffee, sandwiches and pastries. HISTORY/MUSEUMS: Pearl Harbor, Bishop Museum, Waikiki Zoo, all easily accessible. The Bus is an incredible value and stops right in front of The Ilikai. The Bus stops just outside the hotel, to: Diamond Head, Bishop Museum, Waikiki Zoo, Aquarium, Aloha Tower Marketplace, Ala Moana Center, Movie theaters, Pearl Harbor, Chinatown, and more. We retain an excellent local island agent who remains available during your stay. Hawaii lic. W3006300601. Spend your time looking forward to your vacation... not worrying about where to stay. We hope to have you stay with us on your next Waikiki vacation! We have enjoyed getting to know our guests over the years and being part of your journey to the islands. We love these incredible rainbow and sunset photos that so many of our guests forward with aloha. We always remain personally accessible to you - by phone and email. Once you're booked, we take it from here! From the moment you arrive, our excellent onsite agent, Terry, is always available and stands ready to assist you throughout your stay. The Ilikai is the most unique oceanfront property on Waikiki Beach. Get away from it all on the beach, or walk up and over to busy areas of Waikiki. Part Hotel, and Part Condo, the Ilikai has a wonderful Resort Atmosphere with activities and great dining, extra perks and amenities. There is even an "ocean" of self parking ($1 or less per hour) right behind the hotel (and next to the real thing!) which most Waikiki hotels do not have. Simply put, there is nothing else like the Ilikai. The stay was enjoyable and really had no significant issues except the door lock! The code only worked sporadically. We were given a key to use which was great (except it would have been better to have two keys so we did not have to figure out where each person was going to be when we returned to the unit). Inconvenient but not the worst by any means. The Kuerig that didn't work was replaced within 2 days and the faucet that was very lose was fixed within 3 days (it was still usable so no big deal). Nice people to work with but did not plan on having to deal with meeting people for repairs while on vacation. ( this was personal preference rather than required). We had a very lovely time in Hawaii. Our condo was superb!!!! I would like to give it another half star, but VRBO doesn't allow it. Everything was exactly as described. Many extras provided, as listed. Personally, I would recommend the other side of the building, that receives morning sun and can see the fireworks and luau at the HHV. This building is close to everything, very reasonably priced for the location. I would recommend the Ilikai to anyone wanting to visit Waikiki Beach. Great property - great view of marina. The property was neat and clean as I expected it would be. View was what I wanted also. The owner was especiallly helpful in all ways. The hot water fauceet in the bathroomm leaked but I did report that. Would definitely rent again. Great location, clean and well equipped, the condo have everything you need. We love this condo, nice view of the ocean and the marina. We absolutely loved everything about our stay in this condo! The view was great, the condo was clean and nicely decorated. There were fans in addition to an air conditioner. Also the kitchen was well stocked. Did I mention the bed was extremely comfortable? Thanks Jennifer for a wonderful stay! Right next door: Hilton Hawaiian Village Resort! 80 shops, 20 restaurants, Friday Fireworks, Penguin Habitat, and much more. Public transportation: 'The Bus' stops right out front of the Hotel. No Resort Fees! Guests agree to Rental Agreement when booking Online. Free Early Check-In (when available) Free Late Check-Out (when available) Free Wi-Fi ! Free Condo Phone to U.S. and Canada (150 min.) All Guests receive our Complimentary ILIKAI WAIKIKI WELCOME PACKET.